this tool (with the slowest option: 4x). Finally I went in to my bios and and changed the boot priority to boot from cd / dvd first. UPDATE Thanks for the helpful comments. I checked my bios version and sure enough it was quite outdated compared to the newer available versions. Unfortunately I cannot update it yet as it requires a USB which I actually don't have right now. In the meantime I tried burning Mint to the cd and booted that, but the exact same error appears. Also, I tried turning off acpi by adding acpi=off & pci=noacpi but unfortunately it still gives me the error. UPDATE 2 So i finally managed to get my hands on a USB stick. I successfully updated my bios but unfortunately i'm still getting the SATA device failing IDENTIFY PACKET error. Furthermore since i now had a USB i tried disconnecting my cd / dvd drive (which was the device connected to the 8th SATA port) and boot from the USB instead. To my surprise this actually worked...with a "small" problem unfortunatly. Basically after booting from the USB everything is suuuper slow and laggy. The mouse is actually pretty responsive and changes its icon and such just fine, but every time i try to interact with the Desktop environment it is insanely slow (pressing keys or opening folderes, or even just hovering over stuff takes several seconds to register). This could be unrelated but i would appreciate it if someone knows how to fix it. The fact that your ata8.00 or in other words, your 8th SATA device, is failing an IDENTIFY PACKET DEVICE request might be more serious. Do you have an old IDE/SATA device in your system that might be failing? If so, consider disconnecting it to see if it helps. 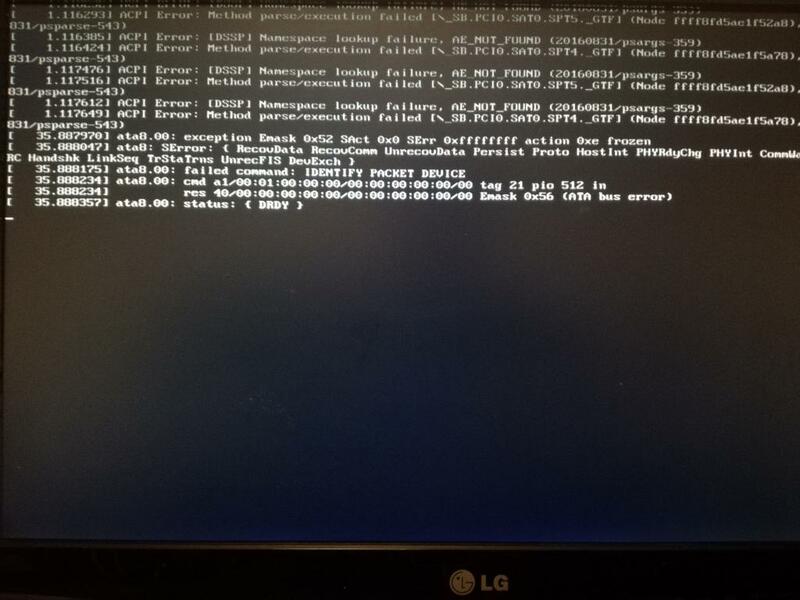 Also, since your system is booting with the default quiet option, there are no boot messages identifying what operations are successful before the system encounters a failure that causes it to get stuck. You might want to press E in the install media's boot menu. It should allow you to edit the boot options of the installer: add verbose to the end of the line as a separate word. Then press whatever key is indicated on screen to boot with the customized options. There should now be a lot more messages. If the system hangs so hard it cannot even output an error message of the actual thing that causes problems, then knowing what was the last successful operation just before the hang is helpful: armed with that information, people who know the internal workings of the installer can then hopefully identify the problem. Not the answer you're looking for? 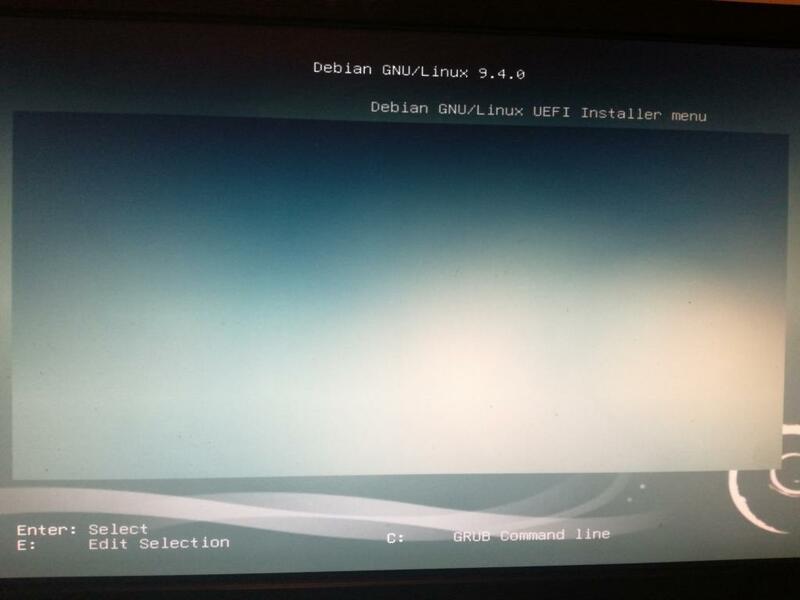 Browse other questions tagged linux debian linux-mint linux-kernel debian-installer or ask your own question.